History was never my favorite subject. I never wanted to memorize places, wars, their years and genealogy of the rulers. Until, I finished my studies and the bookworm inside me woke up again and now it has gone totally opposite way. The subject I despised earlier, now has become my favorite. Being in northern part of India, the books, references and even pop culture like movies has nothing else but the history of this part only. Even the current historical fiction too are available for this part only. And that made me wonder, what could be the story/ies of the southern states of India? The states where Zamorin allowed foreigners for the first time. The states which ruled thru their spice trades. So I started searching for such books. And luckily I found this one. The Silent Witness written by Anuradha. Synopsis promised this is going to be something different and indeed, it is something that is not read by me since long time. 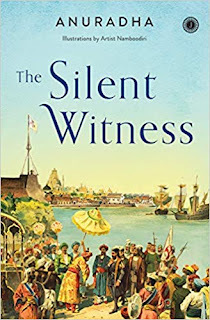 The Silent Witness tells the story of Kerala. At the time, when Portuguese ruled it.At the time that even a small state like Kerala of today, was not one state but several kingdoms were interlinked to each other by one force or another. Dutch, Samoothiri, Kochi, Varmas and more. The story revolves around Kerala Verma and his brother. Both also known as Kochunni and Kuttan Thampuran. How conspiracies made them go into disguise, how Kochunni meets Unnimaya-a beautiful girl, how the strength of small states proves futile for statesmen of Portuguese. And how they are forced to move out of God's own country. The canvas is very wide and looking at the page nos. I knew this is not actually a lengthy one at storytelling despite the fact it covers a vast time period. But still, it keeps you engaged because of the freshness of premises. This is perhaps my first ever read which is set in south India. And that make the reading experience unique. Characters like Kochunni, Kuttan and even Unnimaya are writter in a very simple way, not to exaggerate their bravery or beauty. But a well balanced, true to life, take makes it more worthwhile to read it. Thought I have never been to Kerala, and this was first time I was reading about the area, it was a bit difficult to connect to certain scenes and rituals and even daily chores-which must be nostalgic to a south Indian reader. But still, it is an enriching and refreshing experience to read such things. Anuradha's pen does not master at the action though, and that's why you get to read war sequences in a lighter, non-descriptive way in which scenes move fast and only basic idea is give. But no, I am not complaining here because everyone has their own style. 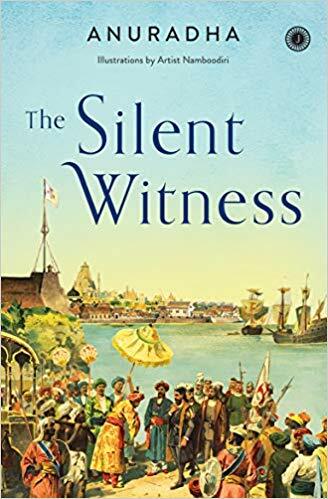 The Silent Witness definitely takes you out in an unknown land, despite the fact that it is just a leaf out of the history of our country. History - that is full of such leaves which needs attention. And here Anuradha does just that. I would recommend this to all fiction lovers as well as history lovers. It is surely a worthy read. Seems interesting. Thank you for sharing!